Every girl deserves the long prom dress of her dreams, and she is sure to find it in this collection of 2019 prom dresses and long formal gowns. 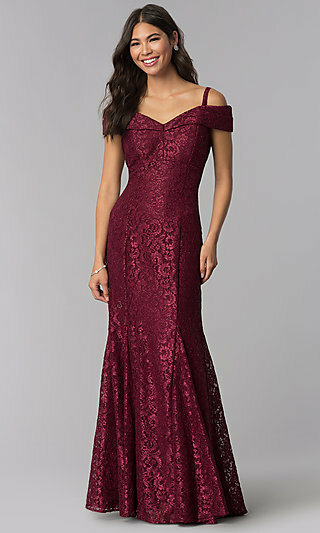 If you’re looking for a long dress or evening gown for prom, make PromGirl your go-to online prom dress shop. You'll find a huge selection of long prom dresses and formal gowns that will make prom a fantasy dream come true. Why Wear a Long Prom Dress? Prom is a once in a lifetime event, so use it as an opportunity to dress up in a fancy long prom dress for this exciting milestone in your life! You can even go all out with a glamorous red-carpet look for prom by dressing in a celebrity-inspired prom dress! 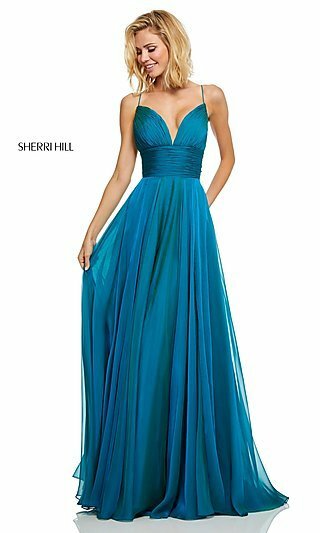 Look like a Hollywood star in a sophisticated long dress with sparkling embellishments, or feel like a queen for the night in a stunning lace-embellished 2019 prom dress with a gleaming satin mermaid skirt that hugs the curves. Elaborate long tulle ball gowns and sheer-illusion long dresses for prom are a good choice for an ultra-feminine look that is sure to make you feel like a princess on your extraordinary night. Shop PromGirl’s large selection of elegant evening dresses and long prom gowns that are sure to make your formal event a night to remember. If your personal style calls for subtle elegance rather than celebrity glamour, a long prom dress is still the way to go for prom 2019! For a classic and sophisticated vibe, there are off-the-shoulder prom dresses and flowing chiffon long prom gowns. Prefer to rock the latest fashions and trendy dress designs? Explore the long formal gowns and long dresses for prom 2019 with bold statement backs. There are sultry jersey evening gowns with caged-back designs, lace corset prom dresses, open-back long prom gowns, and high-neck prom dresses with back cut outs. Shop this collection of long prom dresses, from super cute and sweetly enchanting to sleek and sophisticated, for the perfect formal gown that is just right for your individual style. 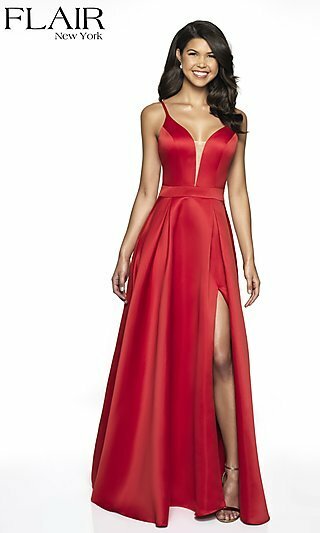 Prom 2019 is your red-carpet moment, so fulfill your wildest prom dress dreams with a long formal gown from PromGirl and celebrate your special evening in style.